Your winter in Brazil's sun. Comfortable and full flat with great location!. We have other properties for up to 15 people. Virtual Tour: Season. with. br / 01 Included bed linen and towels for all guests. Check-in from 3 pm and check-out by 1 pm. Individual, weekly and monthly negotiable packages. Hotel Dom Fish - In Florianopolis (Canasvieiras). Spacious and comfortable home with 4 Baths sleeps 10 adults. Home away 300m from the beach and trendy restaurant TAIKO in Jurere International. Located in Bacia Sao Joao. Sublet.com Listing ID 2821280. For more information and pictures visit https:// ... /rent.asp and enter listing ID 2821280. Contact Sublet.com at ... if you have questions. Located in Florianopolis. Sublet.com Listing ID 2573791. For more information and pictures visit https:// ... /rent.asp and enter listing ID 2573791. Contact Sublet.com at ... if you have questions. Located in Gramado Canela. Sublet.com Listing ID 2327173. For more information and pictures visit https:// ... /rent.asp and enter listing ID 2327173. Contact Sublet.com at ... if you have questions. The Space A wonderful, tastefully furnished apartment located directly in front of the Atlantic Ocean in the midst of the Atlantic Rainforest. From both balconies you can hear the sound of the ocean waves. Apartment with jacuzzi in Campeche. Penthouse with jacuzzi in Palm Beach condominium with resort structure on Campeche beach 200 meters from the sea! Family condominium with resort structure offers adult and children's pool, gym, games room, pub, parks. Apt in Praia Brava currency with Balneário Camboriú. Lujo y conforto en la Beira Mar Norte. Fully equipped apartment with 1 bedroom and garage. Very well located, close to supermarkets and the best restaurants in the city, bakeries, cafs and the promenade, where you can go for a walk, run, or take in a fabulous sunset. Beautiful house with pool 50 meters from the beach. House with a large swimming pool of 7x3 meters and only 50 meters from the beach of Campeche, with 03 bedrooms, 02 bathrooms, 01 suite and in a very safe and with lots of vegetation. Penthouse apartment overlooking Atlantic Ocean with a private swimming pool!. An exceptional 4 bed penthouse apartment, incorporating private swimming pool, a large balcony and roof terrace offering breathtaking views over Atlantic Ocean. House for rent in Bombinhas. 3 Seafront Houses - HOUSE #6. Mariscal beach - BOMBINHAS - BRAZIL - Mar de fuera. The wonderful village of Bombinhas has 18 beaches, the largest of which are Bombinhas, Bombas, Quatro Ilhas, Mariscal, Canto Grande, Morrinhos and Zimbros. SUPER PROMOTION NOVEMBER DECEMBER 22, 2017 CONTACT WATS 47 9 9997127. A great apartment all with laminate flooring. In the large box bed suite, it has air-conditioning spliter 9000, 32-inch plasma tv and a large wardrobe. In the second bedroom has air conditioning spliter 9000, normal double bed and wardrobe. Apartamento Atalaia - 1 dormitrio. Ap. 1 dormitrio no Bairro 'Menino Deus'. Acomoda at 5 pessoas. Localizao privilegiada em rua calma e arborizada e a apenas 3 km do centro da cidade. Our house accommodates families with children and accept pets. Our house is in a family environment in the same block from the beach, a quiet beach with no waves. House on the top floor with 3 bedrooms all with air conditioning. (1 bedroom with a double bed, 1 bedroom with a double bed and one single and 1 bedroom with two single beds). 2 bathrooms. 2 rooms, kitchen and service area. Cable TV. Bed linen. 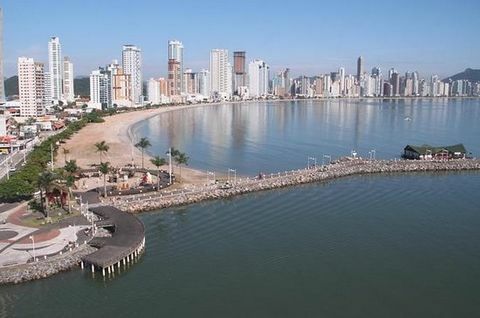 2 bedroom Apartment-front av Brazil-3-2 balconies air condicion. 100 meters beach. 2 bedroom apartment 100 meters from the beach, facing Brasil Avenue, with 3 large balconies, all complete - air conditioning in both bedrooms and living room. cable tv sky-sofa new bed in living room. 3 houses facing the Sea - Mariscal Beach, Bombinhas, SC - HOUSE # 7. I have four houses, three of them in the condominium RESIDENTIAL GUILHERMINA (ads number 4,134,171 (THIS ONE), 4,134,170, and 536 256 942), and a condominium PETIT VILLAGE with swimming pool (announcement number 4072981). Beautiful beach house Rose, sleeps up to 10 people and pet friendly.